The second variation in this series works on puck control in transition and acceleration with the puck. As the players go down the ice they still receive the puck and make one quick stick handle before making a pass back to their partner. When the players turn to the outside they accelerate to the outside with a puck. At the cone they transition backwards with the puck to the inside cone. At the inside cone they transition forwards and again, emphasis is on accelerating to the next cone. 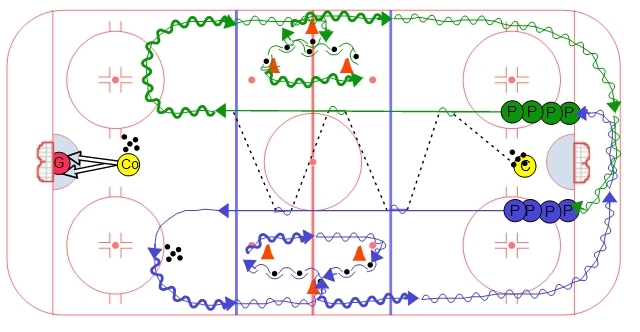 At the third cone they transition backwards again to the first cone where they transition forwards and accelerate with the puck to the blue line. Players will switch lines for their next repetition so they have a chance to worrk on forehand and backhand passing. Great drill for conditioning camp and regular season practice.